Jane also included lots of extras that I forgot to photograph. 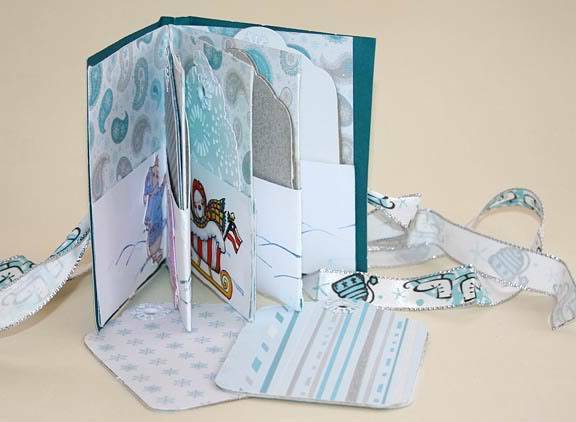 There were shaped tags, snowflake charms and a snowman garland, all for the recipient to add to the book if she chose. Such icy colours in this. I froze just holding it, lol. There's some lovely images stuck on the pockets and the blank tags are covered both sides. All the extras made for a lovely book. it does make you go Brrrr just looking at it ! Perfect little book for the time of year, its gorgeous. Gorgeous - it made be go all shivvvvvvery. Lovely wintery feel, pretty tags. did y'all notice the snowman on the sledge with the flag? i had to put him on even though he wasn't in the colour scheme. Great colours , great idea , a fab book. Lovely, very seasonal and the decorations look great. Excellent! This has turned out really well Jane, lovely colours and theme! Glad you joined in your first swap now? I hope so! Lovely frosty colours Jane, well done. Lovely book Jane and very apt colours for the theme. 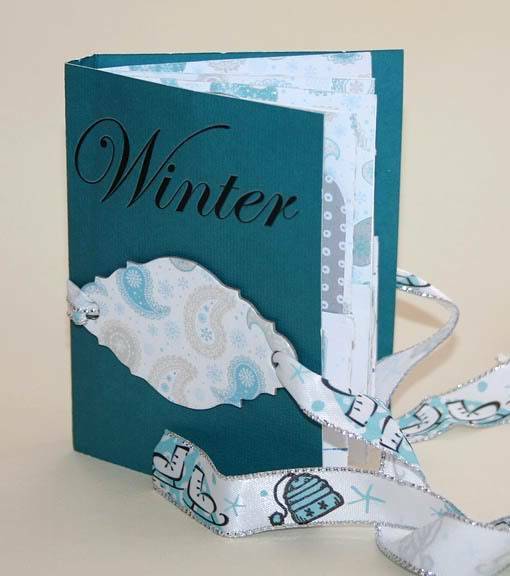 I love this one, great for memories of this winter. Great colours used and just right for the weather we have had this winter. nice one Jane hope you enjoyed your first swap. So so sorry Jane. Yes I received it and its lovely. I really thought I had put this on way before now but I havent. I sorry I have been so tardy of late. Lovely to see you Joy, thanks for letting us know and hope you didn't mind me sending the message.